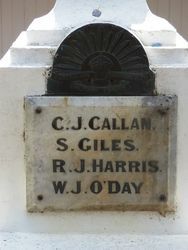 A monument commemorates four men from Panton Hill who died in service or were killed in action during World War One. At the instigation of the Rev. E. S. Chase we have appealed to the public of Panton Hill and district for subscriptions towards a fund for the purpose of erecting a memorial cross at Panton Hill. The public has proved irresponsive to the rev. gentleman's noble suggestion. We have only to look around, in neighbouring townships to see the fine patriotic spirit displayed by the people in this and adjacent Shires. 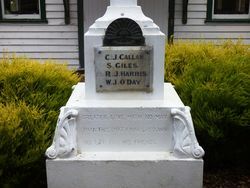 Note the fine memorial stones, at Heidelberg, Eltham, Diamond Creek, Yarra Glen and even Christmas Hills, which has no population compared with Panton Hill. There is one great reason why a strong movement to erect a fitting memorial should be made, and that is, some of the fallen boys from Panton Hill have no marked resting place in France. They come under the heading of " The Unknown Warrior." Their remains lie some on the upturned battlefields of France. The military authorities have made a vigilant search, and though many bodies have been recovered from the shell-torn fields a large number of these are "unknown warriors." Residents from districts whose fallen have no marked resting place should, if they have any of the finer sense of nobility and pride and love of their country's honor about them, contribute freely and unasked towards such an appeal as a fitting tribute to the memory of those lying, somewhere in France who gave their lives for this district's honor. A Memorial Cross in memory of the fallen soldiers of Panton Hill is about to be erected in the churchyard. The cross itself will stand almost ten feet high, and is estimated to cost £40, of which £30 has already been raised, and some effort will be made to raise the remaining £10. 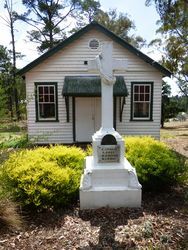 During October, it is hoped that His Grace the Archbishop will visit Panton Hill to dedicate the cross and altar vases of St. Matthew's church and to unveil the fallen soldiers' memorial. Advertiser (Hurstbridge), 17 September 1926.